So many plums, what to do with them all! I’ve bottled some and frozen some for sauce making come autumn. We’ve made plum, crumble and orange blossom water poached plums, and plum cordial. 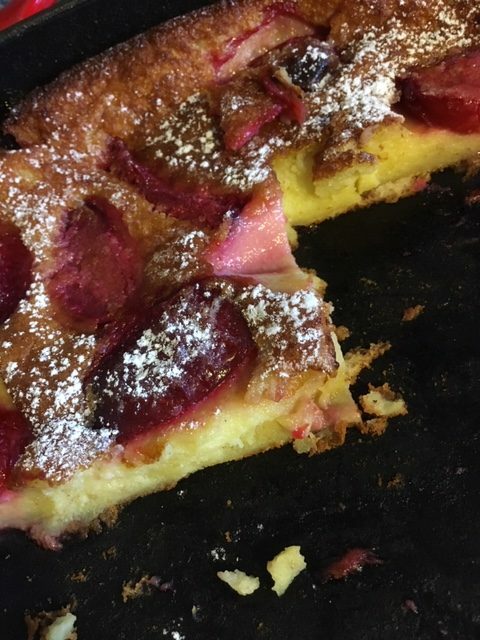 However I’ve been wanting to make a baked plum custardy thing so did some googling and came up with this desert called a Clafouti. Exactly perfect. I tweaked a few different recipes more to my liking and the result is superb! Sweet sour aromatic plums crisply edged soft creamy custard centred. 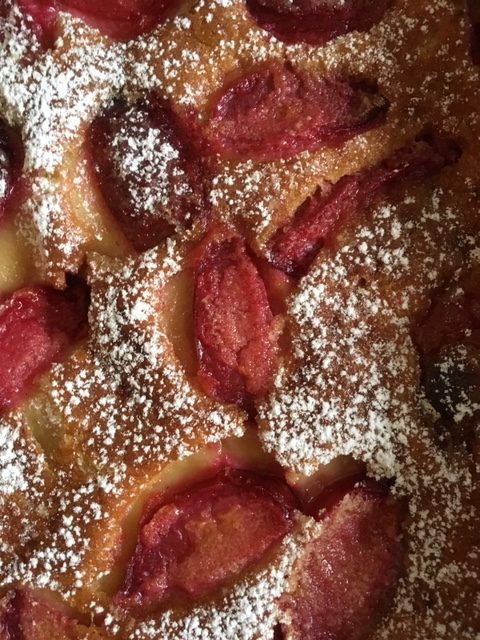 Ingredients; 8-10 plums, a bit less than 1/4 cup sugar, 1 Tbsp butter, 1 teaspoon orange blossom water, 4 large free-range eggs, 1/2 cup sugar, 1 tsp vanilla paste, 1/2 tsp almond essence, 1/4 tsp salt, 1 cup cream, 2/3 cup milk, 2/3 cup (heaped) plain flour, 1/4 cup almond meal. I used a large 11 inch cast iron pan but you could use any suitably sized oven proof baking or pie dish. 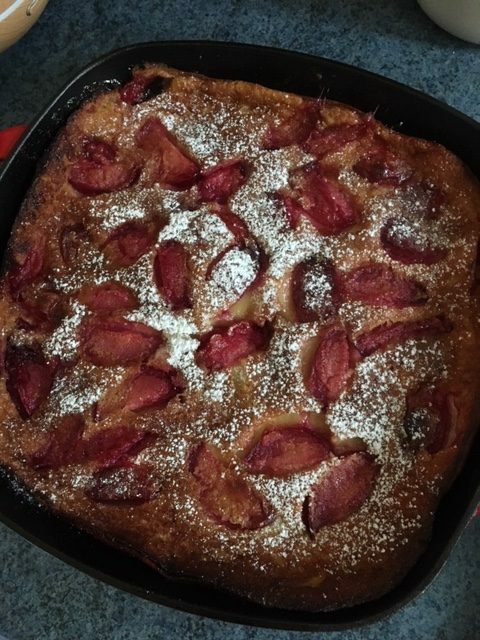 Method; In the pan I melted the butter to grease the base and up the sides, then evenly placed the sliced plums (cut into 1/8ths stones removed) and sprinkled over the 1/4 cup sugar. Lastly drizzle over 1 tsp orange blossom water. Place on the lowest rack of a preheated oven (180C) and bake for about 10 mins until the plums have softened and smell delicious! Remove from the oven and keep aside. Whisk together in a medium bowl the 4 eggs, 1/2 cup sugar, salt, almond essence and vanilla paste until it becomes somewhat paler, about 1 minute. Add flour and almond meal and continue whisking until smooth. Lastly add the cream and milk continuing the whisking until well combined. Replace the plum pan in the oven for about 5 minutes to bring the pan back to a heat before gently pouring the batter over the plum/sugar mixture. Return to the oven and bake for about 30 minutes. Make sure it’s well cooked. It’s meant to be eaten at room temperature as it sets beautifully and shrinks back into itself with the plums becoming more prominent. Just a light sprinkle with icing sugar to pretty it up. Serve with a dollop of some creamy thing to your taste…cream, ice-cream or yogurt.